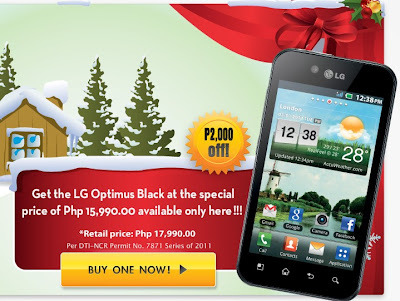 LG is offering its slim 4-inch Android phone, the LG Optimus Black, on a promotional price of Php15,990 which is a discount of Php2,000 from its current market price. The promotion runs until December 18, 2011. The promo mechanics are a bit more complicated than I would have liked. To avail of the promotion you have to buy it online through LG's website and payment must be made through a credit card or paypal account. The phone will be delivered to your address. Would be better if they just offered the promotional price on over the counter sales. Anyway, you can get you the LG Optimus Black at the promotional price by following this link.